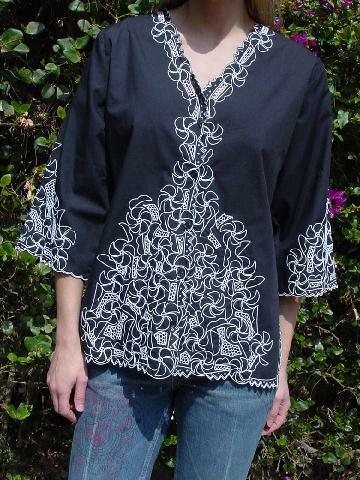 This vintage black jacket was especially made for Kroshetta and is 65% polyester and 35% cotton. It was made in the Philippines. The tag says it's size 12, but it fits like a size Small. 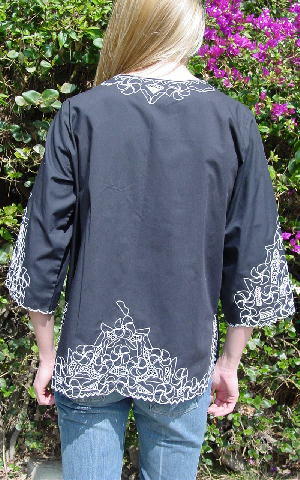 It has a black background with white embroidered flowers and designs on the front and back. It also has embroidered geometric figures with see-through interiors. There are 5 black buttons down the front and two 6 3/4" side slits. It has a V neckline with embroidery around the back, front, along the bottoms, side slits, and sleeves. 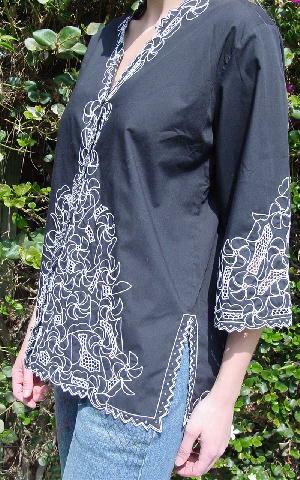 Except for the back neckline, all the edges have scalloped embroidery. She picked it from a stylist's collection as a bonus for helping her put together wardrobe for a campaign. shoulder to end of sleeve 17"
shoulder to hem 26 3/4"
armpit to armpit 20 3/4"